You may have noticed that Facebook rolled out a “Stories” feature in Spring 2017. And if you’ve joined the increasing number of businesses using Instagram in their marketing strategies, you may also know that the image platform has had Stories for even longer. What is this feature? What does it do? How can it help you build social media engagement for your agency? To fully tell this story about Stories, first we have to go back to its source: Snapchat. This mobile social media platform was started by a group of Stanford graduate students in 2011. It quickly gained enough steam to become one of the most popular messaging and social media apps for millennials. Today, Snapchat boasts approximately 166 million daily active users, over 70% of whom are millennials. Snapchat allows you to send self-deleting pictures and videos to friends and family that you’ve connected with on the platform. What you may not know is how you could use the power of this platform to reach new groups of potential clients. Several financial services companies, such as JP Morgan and Goldman Sachs, have dipped their toes into marketing via Snapchat. Yet the platform remains relatively un-utilized by businesses in the financial sector. 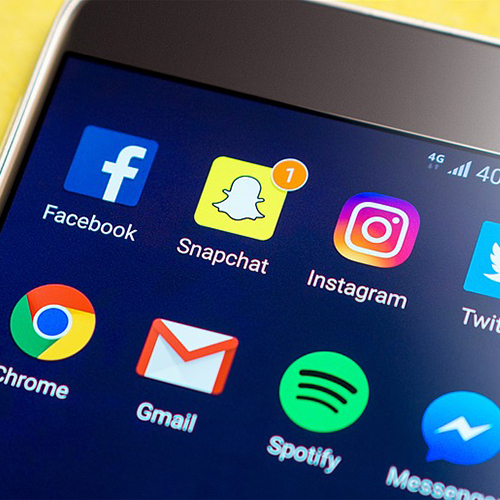 Consequently, insurance agencies now have the opportunity to stand out among their peers by establishing a Snapchat presence. Because Snapchat is fast-paced and fueled by spontaneous content, so many tried-and-true approaches to social media marketing won’t work here. In other words, marketing via Snapchat requires mindfulness and dedication in order to be successful. Snapchat content is in-the-moment experiences that you share with your followers. That makes it perfect to give users an inside look at the personality and culture within your business. Update your story with images and videos of office events, humorous interludes, or local experiences. Give sneak peaks or teasers of upcoming launches or new campaigns. Demonstrate your expertise by sharing tips or how-tos on insurance-related subjects (like purchasing auto insurance or getting a home inspection). Geofilters are location-specific flair that users can add to their snaps to show where they are or what they’re doing. Create your own geofilters to help your followers spread the word about your agency. Use the “lenses” filters to add fun and creativity to your snaps. Grow your follower base by screenshotting your snaps and promoting them on your other social media accounts. Each user has a scanable “Snapcode” in their profile icon. Promote your snapcode across your social media to attract followers on Snapchat. What Does Snapchat Have to Do with Stories? So how can you adapt these approaches for use on Facebook and Instagram? That’s where the Stories feature comes into play. Like Snapchat, these are time-limited posts not accessible to viewers after 24 hours. As of right now, Facebook Stories can only be used on personal accounts and not on business or organization pages. (If the feature is successful, Facebook plans to roll it out for pages in the future.) For the time being, though, you can easily use the Stories feature to promote your business on your personal Facebook account. How? Try using the strategies outlined above for Snapchat. The content you put on stories can be more spur-of-the moment, such as a special Friday lunch outing, or a meeting with new customers. Like Snapchat, Facebook Stories also offers many filters for a nearly endless variety of creative options that can add fun and playfulness to your marketing strategy. Instagram Stories, on the other hand, are available to all Instagram users, including businesses. Though it doesn’t have the wide array of fun filters offered on Facebook Stories, it does add Rewind (reverse video) and Boomerang (mini-video that plays forward and backward) features. Additionally, via Facebook, you can create ads to appear in Instagram Stories, helping to expand your social media reach and to grow your followers. Using Snapchat (and Snapchat-style stories on other platforms) certainly requires social media marketers to be more mindful of sharing opportunities. It can be a challenge remembering to capture those opportunities when they pop up. However, the spontaneous nature of these features makes them a great way to communicate the personality and culture of your company in a way that potential clients can relate to. We think it’s a worthwhile time investment for your agency. Do you think you’ll try it out for your business?